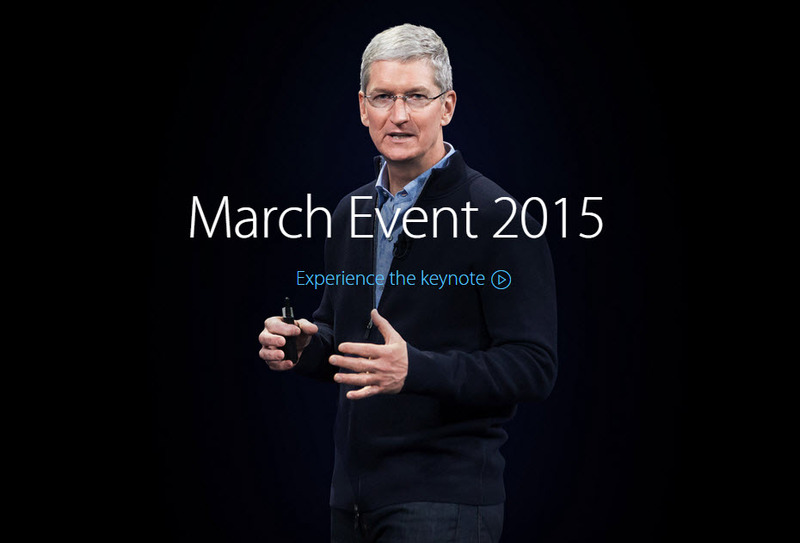 Apple March 2015 Watch Event: What Did You Actually Watch? To be outright, this post will not be a roundup of the announcement itself, but more about what I think the Apple Watch means for Apple and us as consumers from a broader perspective. There have already been numerous summaries of the event on all of the top tech blogs, our very own The Globile News, and you can even rewatch a live stream of the keynote directly on Apple here. If you’ve consumed the media through any medium in the past week you would have heard something about Apple’s new wearable device so there is nothing left to go over in that respect. My post will aim to provide some insight into how the Apple Watch positions Apple as a brand going forward and what it indicates about their plans for us in the upcoming years. Let’s start with the basics: I am an avid supporter of the Apple ecosystem and myself currently own both an iPhone 6 (personal) and iPhone 6 Plus (business), iPad Air (leisurely internet browsing around the house), iPod Nano 7th Gen (gym), Apple TV (streaming, WiFi connectivity) and multiple MacBooks. The device I use most and would not be able to live without is the iPhone 6 I use as my personal phone – it goes everywhere with me. All that being said, the Apple Watch is not a product for me. I repeat, the Apple Watch is NOT a product for me. Will I use one? Sure. Am I in a rush to go out and get one? Not at all. Will it be a hot seller? You bet. If you’ve done your research on the Apple Watch you already know this is Tim Cook’s first personal product at Apple. I say that because typically Steve Jobs would decide the direction of Apple’s product line and then work alongside Jony Ive to come up with the design of the product itself. Tim Cook is and always has been noted for his operational genius and streamlining of manufacturing to keep Apple’s profit margins more than healthy. Since taking over the reins for Jobs as CEO in 2011, this is Apple’s first new device and is very much Tim Cook’s direct manifestation. Here’s some background you might not know: Cook is well known for waking up around 4:30am, getting to the gym around 5:00am and then sending emails to start the day before most people even hit snooze for the first time on their iPhones. The fact that Apple has been touting their watch as a health and fitness application echoes these sentiments; it’s like having a personal trainer which wants you to improve on your fitness achievements week over week. This is a product that Apple dubs in their own words as “the most personal product we’ve ever made, because it’s the first one designed to be worn.” This is a product that is also very personal to Tim Cook (that word sound familiar yet?). He has undoubtedly been using this product in secret during his early morning work outs and believes there is tremendous value to be gained by the rest of the world if we do the same. Let’s get into how Apple went about introducing the Apple Watch and break down each part of the hour and a half keynote to see if we can draw any between the lines conclusions. Although you might come away from this post, which is purely my personal opinion I will add, with different thoughts than me, we can all agree that every single second of the Apple keynote was planned out and calculated so we have to look at everything they presented as a whole to get an accurate depiction of what they were actually trying to show us. The keynote begins with a montage of clips from Apple’s newest store in West Lake, China before Tim Cook comes on stage to state Apple has opened six (6) stores in China in the last six weeks alone. This brings them up to a total of 21 retail stores in Greater China with plans to have 40 by the middle of next year. Why is this important or relevant to the Apple Watch Event you might ask? Well, it is extremely important because it means Apple identifies the Chinese market as one of their top priorities for not only future growth, but future success. Need more proof? Look no further than Apple’s latest and greatest product release where the Apple Watch was originally first mentioned – the iPhone 6 and iPhone 6 Plus – both of these devices sport larger screens, which is a testament that Apple is paying closer attention than ever to what the Chinese consumer not only wants, but values. Still not convinced? How about the blockbuster deal between Apple and China Unicom Ltd. to officially debut the iPhone in the world’s most populous mobile market last year. What about Apple’s choice to display WeChat, China’s most popular messaging app, as opposed to WhatsApp?While some might argue this as strictly good business, I think it is more than that. Apple is taking notes from their largest consumer base and their product offerings are starting to actively reflect that. Keep this in mind and we’ll circle back to China’s role and influence in Apple’s future plans later on in the post. Next up, Richard Pleper, the CEO of HBO came on stage to announce HBO NOW, which means you can now bypass your cable provider and purchase HBO directly through your Apple TV since Apple is the “exclusive partner” for this standalone streaming service. What is the significance here? 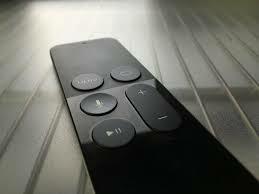 Again, this is simply another part of the larger puzzle of Apple’s next big move – your home. Yes, you read that correctly – Apple’s next big move will be in the iOT (Internet of Things) space and their much anticipated TV will serve as the center module for your home’s ecosystem. The Apple Watch, which is Apple’s self-proclaimed “most personal device yet”, is simply the bridge to give Apple the key to your most personal, private space – your home. The Apple Watch was demoed as opening a garage remotely via an alarm.com app, but what if Apple’s products started to automate all of your home’s movements based around your preferences, much like Wink and SmartThings are trying to do. Google snapped up Nest which was started by former Apple employees and Samsung acquired SmartThings to get in on the action, but Apple has remained on the sidelines. As the leader in consumer-centric software and adoption rates, you don’t think Apple will look to provide its customers with the ultimate control of their own homes? Think about the ecosystem Apple already has in your house and I’ll use myself as an example – the iPhone, the iPad, the Apple TV, the Macbook, the iMac, etc. – do you own more than one Apple product? Chances are if you own an iPhone, you own at least one other Apple product and I think this is how Apple is thinking about their target market for the Apple Watch. There is also the reverse halo effect of people who will want an Apple Watch, but now need to transition to an iPhone in order to experience the smartwatch that they want. Who better to let into your home full time than Apple? This is a perfect market for Apple to enter into next – it’s currently burgeoning, it’s fragmented, there is high consumer interest and there is currently no “perfect” solution that pulls it all together in a seamless manner. If Apple can step out of the consumer electronics realm and step into the luxury and fashion worlds of watches and timepieces, why wouldn’t they be able to step into home products controlled by their very own software? Look at the attention to detail they pay to the architecture in their own retail stores – this is very much something that piques Apple’s interest and getting you to first wear their most personal device yet makes them one step closer to letting them be the most personal company in your life to control everything you do in your home. More to come on this, but for now let’s get back to the keynote and break down the rest of the presentation to piece it all together. After HBO NOW was announced, Apple took the time to present us with some pretty impressive iPhone stats to the tune of 700 million iPhones being sold to date, with a 49% Year Over Year Growth Rate, which was almost double the industry standard of 26% in the last quarter. 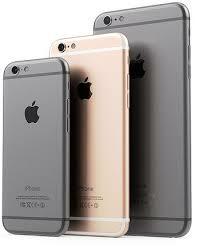 This propelled iPhone to be the #1 selling smartphone in the world with a 99% Customer Satisfaction Rating. How does this relate back to the Apple Watch? Pretty simple – market size and convenience to the consumer. This was immediately followed up with how one of Apple’s latest features, Apple Pay, is revolutionizing the way we pay for things in a more than ever mobile environment. It’s important to keep in mind here that in order to use an Apple Watch, you must have an iPhone. It is also important to keep in mind that although the iPhone has made our everyday lives easier and simplified things we do in so many ways, there is still one major hindrance to all this modern convenience – physically lifting the iPhone out of your pocket/bag to make it do all of these things you are used to it doing – texting, calling, engaging in apps, paying for goods, etc. 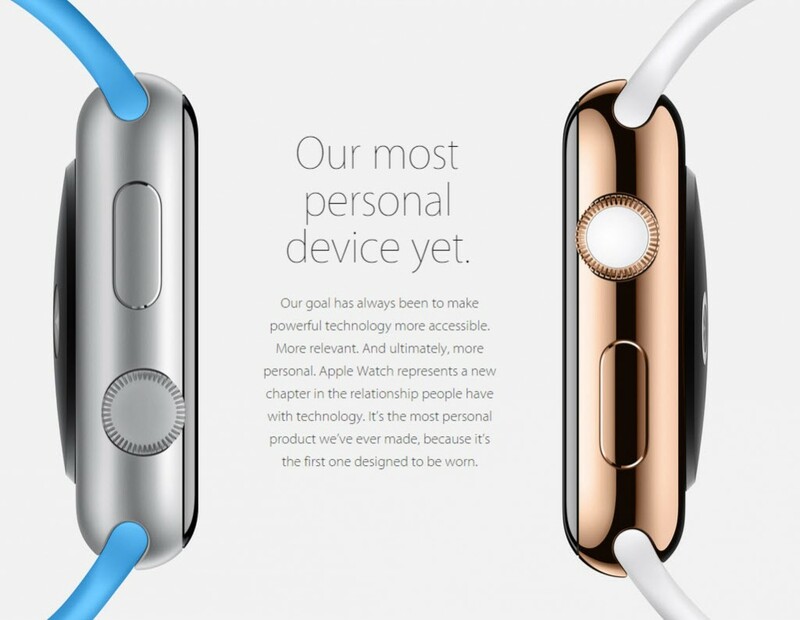 – with the Apple Watch you get all of this convenience in a more convenient form factor. Starting to make sense? Let’s take another look at why Apple told us that they sold 700 million iPhones to date – if 10% of these “qualified consumers” (remember, you need to have purchased an iPhone in order to use the Apple Watch), purchase an Apple Watch over the course of the next three years, that means Apple will have sold ~70 million smartwatches, which is unheard of in this category thus far. To put that in perspective, Apple has sold about 200 million iPads since its introduction in 2010, which equals to about 50 million iPads per year. If we use averages for the iPhone, 700 million iPhones in 7 years is about 100 million iPhones per year. These averages are partially skewed because Apple has sold more iPhones recently than it did in earlier years due to the AT&T exclusivity, global distribution, enhanced product lines, etc. and iPad sales growth rates are on the decline lately, but it does give you a rough estimate of how many iOS devices Apple can move in a specific category. Let’s not forget that the iPad was originally marketed to consumers as a device that “would fill the gap between smartphones and laptop computers”, while the Apple Watch is aiming to bridge the gap between smartphones and our everyday physical lives. I think Apple will easily sell 10 million Apple Watches in the second half of 2015, with it being the hot holiday gift to make good on all of your New Year’s weight loss resolutions. To put that in perspective, the WSJ currently has Apple pegged at moving 5 million units per quarter. Let’s go back to the inclusion of the iPhone stats in relation to the Apple Watch. If you go to 14 minutes into the keynote, Tim Cook says while the iPhone was introduced as a “revolutionary mobile phone” and the “best iPod we’ve ever created” with the “internet right in your pocket” it now does so much more and is “never more than an arm’s length away..” BINGO! The choice wording of an arm’s length away and pocket allude to this gap in how we as consumers interact with our iPhones and how the Apple Watch will alleviate and eliminate all of that. Let’s keep going. Next up in the keynote was the discussion of the iPhone to medical applications. Apple believes more iPhone users would be more than happy to contribute more data to better medical research if it was simply easier to do so. As a result, Apple is trying to make it easier via ResearchKit, which is a “software framework made specifically for medical research” (open sourced, might I add). This addresses Apple’s macro sense of “solving problems” rather than simply “making products” and lays the groundwork for how important the Apple Watch could be to not only improving our own personal health, but the entire medical research field as a whole. Apple believes their products can be used to gather better medical research which will lead to better solutions and more breakthroughs in the medical field than ever before. After this Apple introduced an all new, ultra-portable Macbook and the main takeaway was the new colorways it will be available in – mainly the same ones as iPhones currently are – standard Silver, Space Gray and Gold. The gold color is important to note because it again pays homage to the Chinese consumer base and the status symbol that Apple products are. Additionally, it means Apple pays attention to third parties that offer enticing variations of hardware to their customer base because custom coloring your iPhone was available privately before Apple made it available directly. This could have further applications as Apple starts to use more materials in the physical processing of their products., but we’ll touch on that later. OK, now let’s get to the Apple Watch itself. 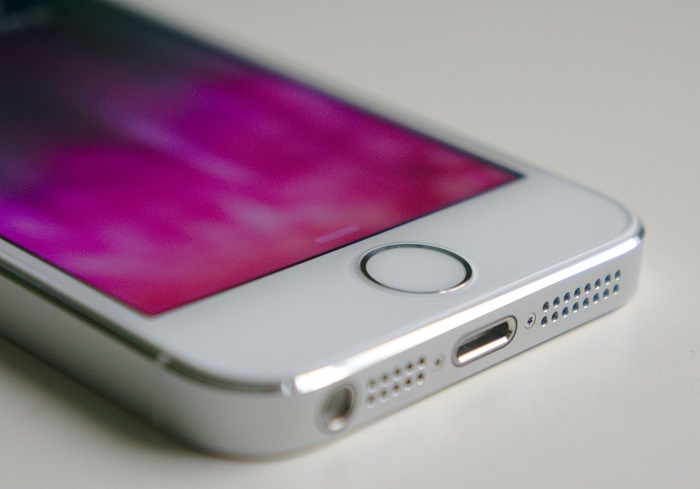 It is pretty much what we thought it would be based on what Apple revealed back in September. What’s interesting to note here, is this is the first time Apple has released a new mobile device with three iterations at once (to be fair it is actually the same product, just distinguished/differentiated by materials/bands). The iPhone didn’t have a second version until the 5C and 6 Plus, which was six years after the original iPhone was released and the iPad didn’t have an iPad Mini until two years into the iPad line in 2012. The Apple Watch is released with three very confusing names. Oh, and there’s the whole price thing. Let’s get into that. What we didn’t know back in September was full model specs, release date and pricing. To make things simple, I’ll display a nice little chart here courtesy of FindTheBest.com which shows us everything we need to know about the models and their respective pricing. The takeaways here are that all three watches are exactly the same – they have the same internals, the same UI, the same apps, the same memory, the same everything – EXCEPT MATERIAL BUILD. The low-end sport model is made of aluminum, the mid-range Apple Watch is made of stainless steel and the high-end Apple Watch Edition is crafted from 18-karat gold that Apple’s metallurgists have specially developed to be up to twice as hard as standard gold by blending standard gold powder with ceramic powder, then heating and compressing it, to create a substance that is harder and more scratch-resistant than standard gold used in jewelry. The catch? It is also “less pure” than standard 18-karat gold products, meaning Apple’s “gold” is not only cheaper to produce, but more scratch resistant. 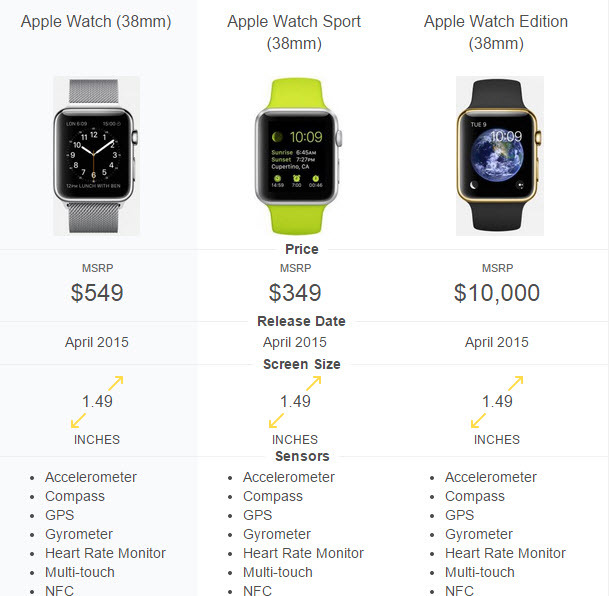 Let’s do some basic math here to explore the pricing element of the Apple Watch Edition. The Apple Watch Edition will contain 55 (38mm size) – 69 (42mm size) grams of gold respectively, or an average of 62 grams per watch. If you take the current average price of gold per gram of around $40, that’s a raw gold cost price of $2,480. Keep in mind that the Apple Watch is comprised of 18-karat gold, which is about 75% purity, so let’s reduce the pure gold cost by 25% to arrive at an average of ~$1,800 for the price of gold in an average Apple Watch. Let’s then knock off an additional 10% for “Apple’s gold” (since it contains ceramic powder) and we’ll get to an average gold cost price of just under $1,700. If Apple is willing to sell their lowest end Apple Watch for $350 (at a profit), we know that the cost of the watch itself plus an upgraded band can’t be more than $300. Now all that’s left is the variable costs they’re incurring for marketing and things of that nature. Let’s say the Apple Watch Edition has a maximum cost of $2,500 ($1,800 gold + $300 watch/band + $400 marketing) and is selling for between $10,000 – $17,000 – think about the profit that is going to add to Apple’s bottom line. To put that into perspective, consider this: the entire luxury Swiss watch market moves about 30 million units per year. Let’s say Apple can convince .25% of this market to try out their watch – that means they would have sold 75,000 Apple Watch Editions with a minimum profit of $7,500 per unit, which is an extra $562,500,000 of profit. Now imagine they can penetrate 1% (or 300,000 units) of the 30 million unit luxury Swiss market and you can see that the Apple Watch, especially the Edition model, has the potential to literally add billions of extra dollars of profit to Apple’s bottom line in its first year of introduction. Wow, that’s awfully impressive, even by Apple’s standards and Tim Cook’s notoriously healthy margins. It looks like the Apple Watch is “healthy” in more ways than one. From a more macro standpoint, the introduction of the Apple Watch Edition marks both Apple’s most expensive product ever by selling price at $17,000 and its largest profit margin by dollar for a single product. The only question is who will shell out $17,000 for an Apple Watch? I would venture to say this product is primarily meant for the Chinese and Middle Eastern consumer – which is why Apple made it such a point to appeal to what they value across their other product lines. To put it plainly, Apple sees the Chinese consumer market as untapped potential with an insatiable appetite – and this is only the beginning. Now that Apple is involved in the production of the metal used in the Apple Watch itself, they have officially entered the gold commodity market. To be clear, there is no company in the world which is better at acquiring large quantities of components for their products at rock-bottom pricing. Apple has long been the largest buyer of NAND flash memory in the world and now they will instantly become a huge player in the gold market. The question to keep in mind is “will Apple only use their new found knowledge of precious metals for applications in the high-end Apple Watch?” or will Apple start to use these metals in limited edition versions of their other products, say an iPhone? Is it not feasible to think that the same consumer who is an avid Apple lover and willing to spend $10 – $17K on an Apple Watch Edition wouldn’t spend $5,000 on a gold plated iPhone 7? Would they not want to match their iPhone to their watch?Look no further than Golden Concept and VERTU for validation to see that consumers are already willing to shell out north of $5,000 for these high-end devices. Now let’s circle back to Apple’s introduction of the gold colored “New Macbook” which I mentioned earlier in my post as important to the Apple Watch event. This new Macbook has less than stellar specs, but no one can deny it is all beauty with its shimmering golden hue and slimmer than thin profile. Is Apple already testing the extension of “gold” onto their other products to maximize the Veblen Effect of their goods? This is standard practice across all luxury items – sale price is never proportionate to cost of the item and actually negatively affects the demand for high-end products – in order to be truly “desirable”, a luxury product must maintain a consistently high price tag. Decreasing a luxury item’s price actually decreases people’s preference for buying them because they no longer carry that air of exclusivity that high-status, positional goods must have. Let’s recap a little bit here: I think Apple is using the high-end Apple Watch as both a way to test the strength of their brand to see how much they can charge for an item and how much of a market they can penetrate. This also takes them out of the “premium product” market where they have positioned their products so well and pushes them well into the “luxury product” market. 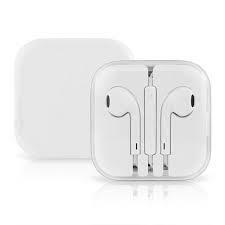 I also think within the next 24 months you will see the Apple Gold found in the current Apple Watch applied to other Apple products, most notably iPhones starting at $4,999 and the possible introduction of a more than premium iPod-type player for non-compressed file formats in the $999.99 range. 1. How “limited’ can a “luxury” timepiece be that is “Assembled in China”? Will the metals be made elsewhere and final assembly take place outside of China? 2. Apple loves planned obsolescence – how will they get Apple Watch Edition customers to buy a new Apple Watch Edition each year? Will they have a special trade-in program to keep you accessing their latest tech upgrades in your latest luxury timepiece? 3. Typical luxury timepieces offer 25-50% markups for an authorized dealer – Apple currently gives retailers a maximum of 5-10% so where will these high-end Apple Watch Editions be sold and what additional profit is Apple willing to give up? I can’t see them giving up more than 20% at an absolute maximum here. 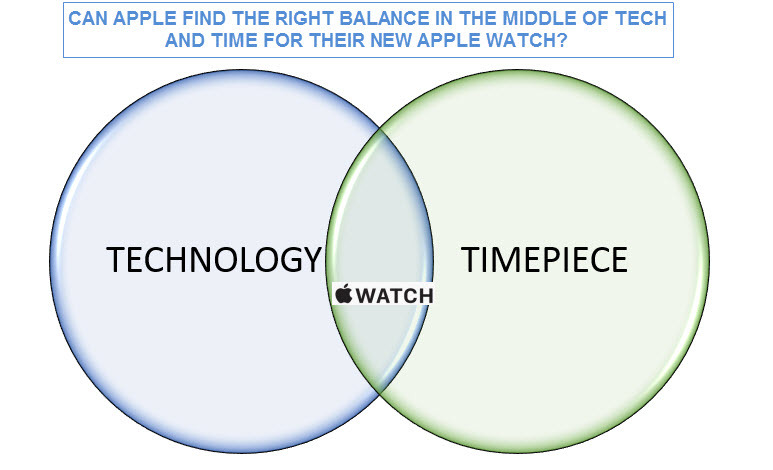 To me, the Apple Watch sits right at the intersection of Technology and Timepiece, but it is disproportionately priced more on the luxury timepiece side of the pie while its functionality is more on the technological side (not that there is an inverse relationship between technology in timepieces). Is Apple’s brand strong enough to make that middle section of the diagram appealing enough to the consumers with both deep enough pockets and extreme love of their brand? For me, there is a mismatch here because a luxury timepiece isn’t always about the metal that makes up the watch itself – which Apple is touting as the only differentiating factor in their extreme price range across this new product line. In fact, the most expensive part of an ultra high-end timepiece (think Patek Philippe) is the number of complications it contains and the time it takes to make. Some of the most expensive watches contain over 30 internal complications and can take years, yes man-powered actual years, to make by hand with all pieces, components and movements made exclusively in-house. Additionally, they only produce around 50,000 watches each year which makes their timepieces extremely limited, even when compared to the most well-known luxury watch brand, Rolex, who produces over a million watches each year. Apple claims the Apple Watch Edition will be “limited”, but has not shared any production numbers yet so that fact alone should be interesting to consider once revealed (if it is). What Apple has done with the introduction of the Apple Watch is taken a step out of the “consumer electronics” market and applied technology to an area of life where they feel their superior software/hardware combination value proposition can benefit people’s lives for the better. Much like Apple stepped out of the computing realm to take on the mobile phone manufacturing giants back in 2007 because they felt they could offer a superior technological experience to their consumers, Apple is taking a shot at modernizing watches, which technology has not yet advanced fully yet. Keep in mind that Apple never made superior call quality a top priority on their iPhones, but rather they correctly theorized that people valued the power of the mobile internet on their phones far more than making and taking calls on their mobile devices and delivered that one aspect far better than any one else did at the point, or has at this point still. In the end, the Apple Watch will not replace your Rolex, Audemars Piguet, A. Lange & Sohne, Patek Philippe, etc. nor is it necessarily trying to, but it could very well serve as a fitting piece in your timepiece collection. More importantly, it is an extension of how far the Apple brand has come since near bankruptcy in 1997, the level of consumers it can attract, and their ability to enrich people’s lives. Think about this for a brief moment: if Apple had announced entering the luxury world back in 2000, what would the reaction have been? Now it is not only feasible, but it is very much happening and is only a month away from arriving with a very prominent $17,000 price tag to a luxury store near you. Now the only question left is will you let Apple continue its forward movement into your personal home after you make the transition to trying (and maybe buying) their most personal product ever made? I guess it’s only fair to say that only time will tell..
7. Apple will announce plans to “break up” the way you pay and watch TV channels offering them a la carte instead of in bundles. This will lead to them making a large, premium display monitor (55″ and up) starting around $3,000 within the next 24-36 months. The TV will also serve as the main integration hub in your home for all Apple products and allow them to centralize all that their products do for you. Again, these are just my humble thoughts meant for nothing more than hungry minds and open ears. Thanks again for reading – be sure to let me know what you think!